If you are using the theme in Basic tab, please do not rename or change the output folder structure. Just upload the generated SWF Flash file to your website and then use the following html code as an example to insert the SWF object into your html code. Normally, if you insert the SWF in HTML editor, it will apply the correct path of SWF automatically. Please refer to the following URL link to know more about inserting SWF file object in HTML editors. 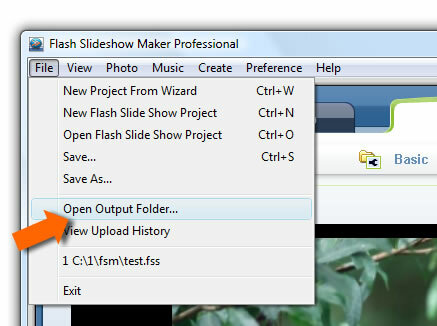 After publish the slideshow, you can open the output folder by click the menu "File" and select the "Open Output Folder.." menu item. Please copy the code section from "<object>" to "</object>" into your own HTML page. Note: 1. 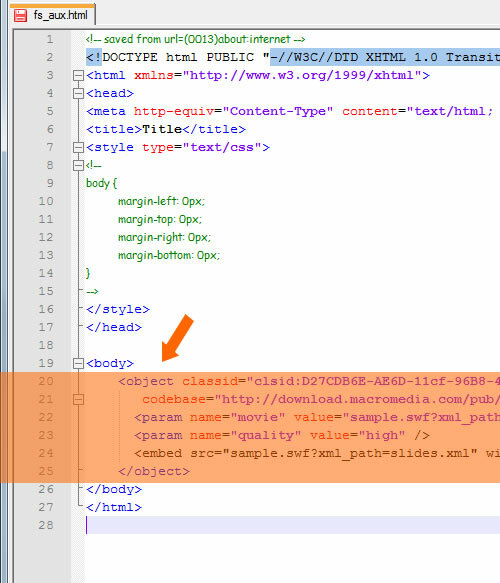 If you are using Dreamwave or Frontpage, you should switch from design view to code view. 2. You should also copy all the files and sub-folders in the output folder to the same folder of your own html file. 3. If you put these files in another folder, please change the code "sample.swf?xml_path=slides.xml" by adding correct path before the SWF and XML file.